Although there is such a thing as a clinically recognized shopping addiction, most of us who are self-proclaimed “shopaholics” are really just in the habit of shopping too much. How would I know? I used to be right there with you. Prior to starting my own personal finance blog in January 2014, I loved to go shopping. I would go shopping with my friends on the weekends, and I’d also go by myself after work during the week despite the fact that I rarely needed anything. Instead of shopping because I actually needed something, I was shopping out of habit. Luckily, I broke my shopping habit and my finances are so much better off now than they were before. 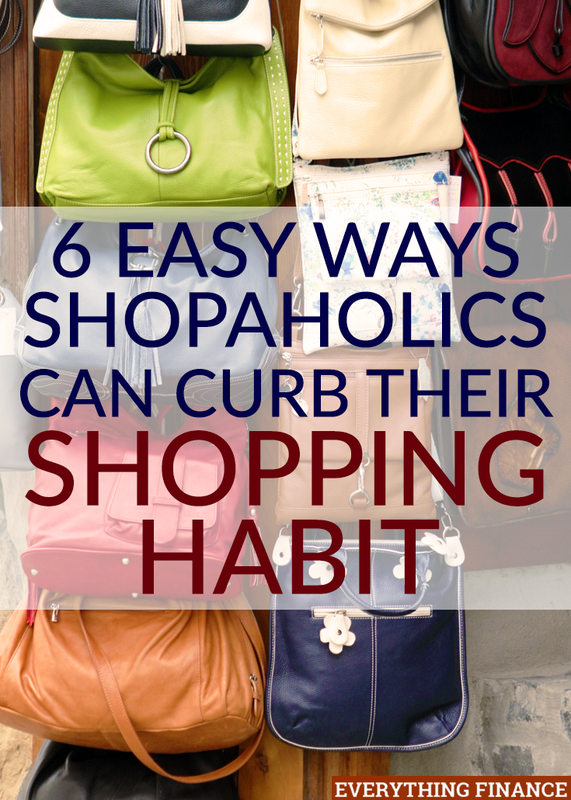 But if you’re still shopping out of habit, here are 6 easy ways you can curb your shopping habit once and for all. The first thing you should do when you don’t know why you have such a strong urge to shop and spend money is to take some time to identify why you shop. It might be that your shopping for other people or your pet cat and buying him that popular cat drinking fountain. Start keeping a written record of your feelings before and after you shop, and how you feel when you resist the urge to shop. This may help you figure out your shopping trigger. For many people, a shopping habit is born from feelings of loneliness, boredom, guilt, or anger. However, shopping can be triggered by many other emotions as well. Personally, I found that the feelings that drove my shopping habit were many of these which stemmed from going through a divorce. At that point in my life, I was using shopping to fill a void. It wasn’t that I needed the stuff I was buying, but it was still filling a psychological need in my life. This is what forms a habit for many people. They use shopping to fill a psychological need and because it makes them feel better, albeit temporarily, they continue to shop again the next time they are feeling down. Unfortunately, identifying why you shop isn’t enough to break the habit for most people. The key to breaking the shopping habit is to find a healthy alternative to fill the psychological need that has previously been filled with shopping. For instance, if you use shopping to avoid anxiety, fear, or loneliness, you need to find another social activity to fill these needs. Perhaps you can call and catch up with a friend on the phone, or join a community activity to help relieve these feelings. One thing to be careful of is replacing one bad habit with another. When you replace your shopping habit with another potentially harmful habit, you have not found a good long term solution. Instead, you need to try and replace your shopping habit with something that is positive, healthy, and uplifting. Brainstorm several positive activities you can try out the next time you feel tempted to shop for any reason other than actually needing to purchase something. As I said, I used to cruise the mall with my friends on the weekends, and I’d occasionally stop by the mall on my way home from work during the week, too. Once I realized I had to kick my shopping habit to the curb, I decided to change my routine so I could avoid temptation. Instead of driving past the mall on the way home from work, I’d drive a little bit out of my way to avoid going down that street. I also took the initiative to invite my friends to do other activities on the weekends instead of going to the mall. This way, I wasn’t even tempted to shop by setting foot in the mall. When you do have to go shopping, which will happen because we all need groceries and household items from time to time, bring a written list with you to the store. This will help you avoid buying things you don’t need. Stay focused on your list and if you find yourself drawn to buy something not on your list, don’t. Instead, write that item down on the bottom of your list so you can think about it until the next time you go to the store. When I’ve used this tactic, I’ve actually found that many of the items I “had to have” when I was shopping are things identical, or nearly identical, to the things I already have at home. It’s rare for me to end up actually going back to buy the things I wrote down to contemplate later. Another tactic I’ve used to help curb my shopping habit is only using cash for my variable budget categories. Leaving my credit and debit card at home forces me to stick to a budget. Because I only carry so much cash (usually less than $200), I have a natural limit to the amount I can spend. This is also a good way to ensure that if you do get off-track and end up buying things you don’t need, you won’t do too much damage to your finances in one weak moment. You may not have ever noticed this, but men tend to have a lot less problems associated with shopping than women do. This is partially because men shop by driving directly to the store they need. They go inside and locate the single item they came to buy. They don’t walk around the store “for fun”. They head straight to the check out. They pay and leave. Men don’t really “shop”. They simply buy what they need, and that’s it. Shopping is not a recreational or social activity for most men. It might be hard and it might sound boring, but next time you need to buy something, try shopping like a man. It will save you a lot of time and money. Shopping can seem like a tough habit to beat, but with these tips, you’ll be living the frugal life in no time. Trust me! Have you ever struggled with a shopping habit? If so, how did you kick it to the curb?